Japanese Room (Upper Stores) - Sleeps 4 - double sleigh bed, single sleigh bed, sofa bed. Shared use of bette bathroom & family shower room. 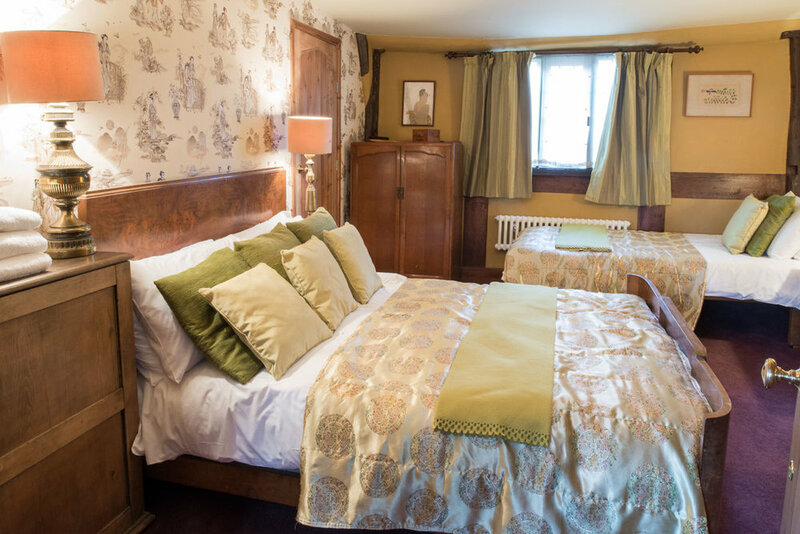 Butterfly Room (Upper Stores) - Sleeps 3 - double sleigh bed, single bed & hand basin. Shared use of bette bathroom & family shower room. White Room (Uppers Stores) - Sleeps 3 - bunk beds, single bed. Shared use of bette bathroom & family shower room. Nell Nile Bunk Room (Uppers Stores) - Sleeps 2 - bunk room which is a walk through room, but curtained off, leading to the butterfly room. Shared use of bette bathroom & family shower room. Rinky Dink Pink (Upper Malt House) - Sleeps 2 (+1) - bunk bed with double on bottom – only charged for as a 2. Shared use of spa space showers and WC next door. These rooms are best for the last party people standing, or younger delegates, as next to the social space. Sunshine Yellow (Upper Malt House) - Sleeps 2 (+1) - bunk bed with double on bottom – only charged for as a 2. Shared use of spa space showers and WC next door. These rooms are best for the last party people standing, or younger delegates, as next to the social space. Arts and Crafts (Lower Malt House) - Sleeps 2 - double bed and en-suite. Woodland Room - Sleeps 4 - king-sized sofa bed and double sleigh bed, plus use of wet room or black and white bathroom. Blue Room - Sleeps 2 - twin room, plus use of wet room or black and white bathroom. Mill End is waiting - Just Add People!